Holly and Shanna: Giving Each Other a New Lease On Life! I like to say (and I often do) that my new book, A Dog's Way Home, celebrates the unique bond between dogs and their people. That bond between Abby and her sheltie, Tam, reunites the two after many trials and tribulations. But the story I created in my book doesn't hold a candle to the real-life bond between my friend Shanna Wilkinson and her sheltie, Holly. The connection between these two has literally saved their lives! In this interview, you'll see what I mean. Shanna, how did you and Holly find each other? I was fourteen and was allowed to pick a puppy from my mom's champion sheltie. This puppy would be my companion and partner in agility and herding and obedience. There was one particular puppy that was having a hard time, and everyone didn't think she'd live. I stayed up and watched over her, making sure she nursed. I assisted my mom in tube-feeding her too. I refused to give up on this pup! I had a strong connection with this little sheltie; I knew she was the one. I kept her and named her Holly. Had you had shelties before? I grew up with shelties and golden retrievers. So, of course, I played with and "trained" the family dogs. When I was in second grade, I had the pleasure of taking care of and training a very special sheltie boy named Tye. He, in his own way, changed my life and showed me to look at things in a different way. But Holly was my first dog. She was all mine to train and take care of and make decisions about. the courage and confidence to still follow my dreams despite my epilepsy. She has given me the independence and security to live a normal life. We've traveled all over together! In 2007, Holly was awarded the AKC Award of Canine Excellence for her life saving ability and work as a service dog. Holly also recently won the Petco Extraordinary Dog contest! And I happen to know you donated your winnings to Sheltie Rescue of Utah. What else do you do to "pay it forward"? Together we go to elementary schools and teach kids about service dogs and how to take care of their own dogs. When I am stopped when we're out and about and asked about service dogs, I always explain what Holly does. Holly has given hope to so many people with epilepsy. My mom and I also put together a huge raffle every year to benefit sheltie rescue. Last year we raised $2,000.00 and hope to raise even more this year! What do you and Holly do for fun? When Holly was younger, we competed as a team in agility, obedience, rally, and herding. Now that she is ten years old, her favorite activity is going out to lunch and going to class with me. I have Holly's daughter, Alaska, who is also a trained and certified service dog. She also alerts when I have an oncoming seizure and will take over for Holly when the time comes. Alaska and I compete in agility, herding, obedience and rally. Holly is my guardian angel. Holly is more than just another dog. She is my life, my love, my protector, my everything. I believe everything happens for a reason, and Holly was sent to watch over and protect me. Wow. See what I mean? Thanks so much to Shanna and Holly for sharing their inspiring story with us! Fido and Friend in Five: Kathryn Fitzmaurice! 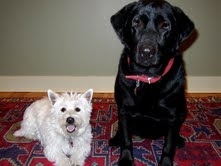 Fido and Friend spotlight today! The lovely Kathryn is the author of the equally lovely and wise middle-grade novel, The Year the Swallows Came Early. In her book, Kathryn explores what happens when her young protagonist's carefully planned-out world starts to go wrong the year she turns eleven. Suddenly, her father is jailed, her best friend's erstwhile mother returns, and the swallows that make their annual migration to her hometown make a surprise appearance. 2. So what makes Holly's tail wag? Holly wags her tail at just about everything. But especially when people come over. Or when we come home. She acts as if she hasn't seen us for ten years. 3. What's your all-time favorite dog story? My favorite dog story is Where the Red Fern Grows. Best dog story ever. 4. If Holly could change just one thing about you, what would it be? Holly is a bossy dog. If she could change one thing about me, she would have me listen better to her orders. For example, she would have me throw her green ball more, or take her on two walks a day, instead of one. Fido and Friend in Five: Patti Sherlock! Okay, confession time: I love Patti Sherlock. She is wise and funny and inspiring and sassy. She loves poetry and can cook a mean bear roast. Yes dahling, I said bear. She's also one heck of a writer and dog mother. Patti wrote, among other wonderful books for kids, the award-winning Letters from Wolfie. In this book, a young boy decides to help his country during the Vietnam war by donating his beloved dog, Wolfie (modeled on Patti's dog, Shakespeare), to serve in the armed forces. 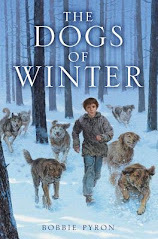 It's not only a novel about the love between a boy and his dog, but also takes a look at how the ideologies of war divided not only a family but a whole nation. 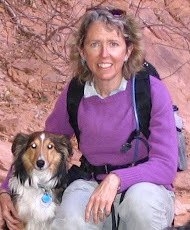 In her latest book, A Dog for All Seasons, Patti writes her personal love letter to Duncan, an amazing border collie she shared her life with on a sheep ranch in Idaho during a very tough period of her life. 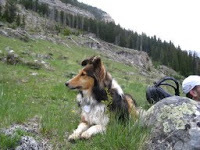 Patti took time out from her busy life on that ranch in Idaho to share the Fido and Friend spotlight with her two dogs, Shakespeare and Mick. 1. How did you and your dogs find each other? I, a single parent, sometimes had to leave my teen daughter alone in the country at night. I heard of a German shepherd\Malamute at the Pocatello dog pound. When I visited him at his foster home, I saw that the other dogs and even the household cats dominated him. His eyes pleaded, “Get me outa here.” I said, “You don't seem very protective.” He sat up tall, and was undeniably large. He went home with me, and a kinder, gentler dog you've never seen. Guard dog? Not so much. Duncan, the Border collie subject of my memoir A Dog for All Seasons, had been dead a year or so when my friends Debbie and Steve offered me my pick of a nice litter of Border collie pups. I chose the biggest and most enterprising, and named him Mick. My kids planned to buy him for me for Christmas, but Debbie and Steve refused payment. What a gift. He is confident, fun-loving, and a wonderful traveler. 2. What's your all-time favorite dog story? Our Idaho Falls, Idaho library has a statue on its front lawn honoring Where the Red Fern Grows, which was written here. I think it's a well-deserved memorial for a touching and enduring book. 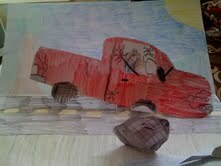 Also, Shiloh, the book, was so much more substantial than what I'd expected from the movie trailer. 3. If Mick and Shakespeare could change just one thing about you, what would it be? 4. What makes your dogs tails wag? Company arriving. When I put my coat on. When I take my coat off. A full food dish. Snitching cat food (Mick). Rolling in disgusting, rotting stuff (Shakespeare). When I sit down on the sofa. When I stand up. Fresh water. Brackish water. In other words, everything. 5. In five words, tell us what your dogs mean to you: They show me what God is like. In honor of the Westminster Kennel Club Dog Show wrapping up today, I wanted to sing the praises of my breed of passion: Shetland Sheepdogs. You might know them as miniature collies or "Little Lassies" but they are a breed distinct unto themselves. The sheltie evolved from a mix of several different breeds, including the tradition rough collie, on the windswept Shetland Islands off the northern tip of Scotland. They were bred to herd the smallish sheep and to guard the herders homes. Thus the reason for the sheltie's trademark piercing and enthusiastic bark! The sheltie was bred to live in rough elements (thus there amazing double coat) and move with speed and agility over crags and rocks and gorse and stuff. No doubt that's why today's shelties excel in agility competitions. 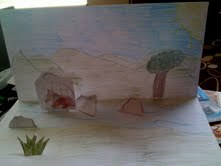 lived with their people rather than with the livestock. 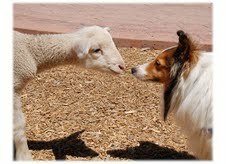 It's why the sheltie in famous for not only its keen intelligence but also for its love and devotion to her people. I always tell people, you haven't been loved until you've been loved by a sheltie. 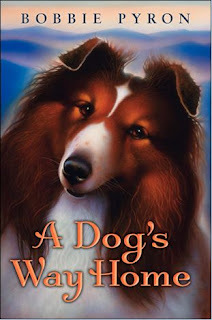 When I was shopping my book, A DOG'S WAY HOME to agents, one wrote me back and said she loved the story and the writing was great, but couldn't I make the dog a Golden Retriever rather than a less "popular" breed like the sheltie. I about laughed myself silly trying to imagine the happy-go-lucky, don't-worry-be-happy Golden braving bears and hunters and starvation and brutal winter elements just to get back to "his girl"! As many good Golden Retriever friends as I have, I just for the life of me cannot imagine that. A sheltie, on the other hand (or paw) would. They may be standoff-ish with strangers, but every fiber of their being belongs to their person and their family. Tam limped over to the lichen-covered outcropping and sniffed the damp moss. It smelled vaguely of skunk, but not too recent. Tam lay down with a sigh and licked the feeling back into his paws, then pulled the sticks and leaves from his tail. His hip still hurt from his fight with the eagle. Tam watched the moon rise above the far ridge, hanging full and golden between two peaks. All the night creatures stirred around him; a fox barked in the hollow below the road. Many times Tam had watched the moon with his girl. Sometimes, they watched from the front porch, with the sound of crickets and the big man's fiddle. Other times, they watched from the window seat in her bedroom. Tam had never known why the girl watched the moon with such longing. It had not mattered to him. He loved the moon because he loved the girl, the girl who held him close as she gazed into the night sky. He'd listen to her steady breathing, the thump thump of her heart. Her heartbeat had filled his world. Fido and Friend in Five: Becky Hall! Utah has an abundance of gifted writers--Shannon Hale, James Dashner, Anne Bowen, Bree Despain, Brandon Mull, Jean Reagan--just to name a very few. As my agent said once, "What is it about Utah and writers?" Indeed! Today, in the latest installment of Fido and Friend in Five, you'll meet Utah author Becky Hall. 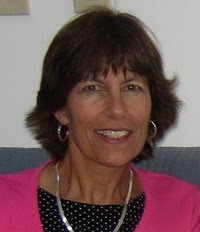 Becky is the author of two informational books for kids, "A" is for Arches: A Utah Alphabet Edition and Morris and Buddy:the story of the first seeing eye dog. And like yours truly, Becky is also a librarian! She and her artist husband, Dave Hall, share their home in Salt Lake City with dogs Mia and, until recently, Abby. came down with parvo and Mia was the only one who survived. I think that's why she's always been a tough little dog! 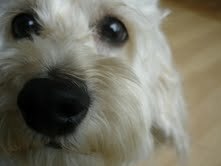 Mia is a West Highland Terrier, so we call her the Pestie Westie and the West Highland Terror. We love her to bits and she's full of personality, but she can be pretty naughty! She's the complete opposite of Abby: she barks, digs, you name it. Unfortunately, in December of 2010, Abby developed an inoperable tumor in her mouth. She was gentle and loving right up to the minute she died. I miss her every day. 2) What's you all-time favorite dog story? Rosemary Wells and Susan Jeffers wrote a series of picture books about McDuff the West Highland Terrier. Plain and simple: the reason I got Mia was because I loved those books! 3) If your dogs could change one thing about you, what would it be? Mia would like me to feed her lamb lung treats every day. Abby would have given me a tireless arm for ball throwing. 4) What makes your dogs tails wag? Lamb lung treats (we just discovered this yummy treat). Also my arrival home. Mia races from anywhere in the house as soon as she hears the click of the key in the lock. Also, if we say, "Want to go for..." anything! Dave, my husband, teases Mia by saying, "Gophers in the wok?" She goes berserk! Fido and Friend in Five: Kathi Appelt! the brave, big-hearted hound in The Underneath who sheltered kittens beneath his generous ears? And then, of course, there's every kid's best buddy, BD (Best Dog) in her latests book, Keeper. The dogs in her books (as well as her cats, of course!) are as richly realized as her four-footed characters and every bit as memorable. So imagine my surprise when she told me she does not have a dog in her life right now! Being the selfless person I am, I offered to give her one of mine--the barkiest one. So for Fido and Friend in Five, Kathi remembers her grandmother's dog, B.D. who was the inspiration for the steadfast friend of Keeper. How did BD and your grandmother find each other? BD found my grandmother on the beach, not far from her house on Galveston Island. She was taking her usual morning walk and BD discovered her. After a quick dog-scan, he decided he would let her take him home and live out his days with her. He was a great dog, a champion bird chaser (his name stood for Bird Dog). What's your all-time favorite dog story? I love Amos in The Amazing Amos and the Greatest Couch on Earth, by Susan Seligson and Howie Schneider. Amos reminded me of a dog I had once named Copper. He was an Afghan Hound, and he and Amos were quite a bit alike. But above all, I just loved the humor and craziness of that book. I think I read it to my sons about a million times when they were small. Once in a while I just have to read it. It always makes me smile. I also loved Cracker in Cynthia Kodahata's beautiful book of the same name. What made BD smile? Singing. If BD could have changed one thing about you, what would it have been? My singing! In five words, tell us what BD meant to you: He loved my grandmother best. Thanks to the amazing Kathi Appelt for stopping by Fido and Friend in Five! One of the absolute best things about writing books for kids is the feedback you get from readers about your books! Yes, great reviews in professional journals are great and all, but hearing how much someone from your intended audience LOVED your book--it doesn't get better than that!. I think that's one of the things I love about writing for kids and teens: they so passionately embrace your book. My good friend and fellow Utah author, Sydney Salter, shared an advance reading copy of my book, A Dog's Way Home, with her youngest daughter, Sophie. Now, Sophie is a very discriminating reader. She doesn't like just any book. So I was pretty nervous to find out Sophie's verdict of A Dog's Way Home! Much to my relief, Sophie LOVED the book! 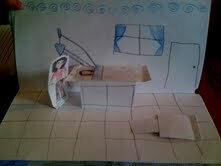 She read it at the breakfast table, as soon as she got home from school, at the dinner table...you get the picture. Which was so great for me to hear! But imagine how thrilled I was when Sydney sent me these photos of dioramas Sophie had created from the book for a school project! 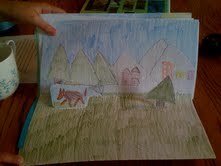 For those of you who've read the book, can you guess which scenes her dioramas depict? And for those of you who haven't read it, it'll be out in three weeks! In anticipation of my new book, A DOG'S WAY HOME, debuting in just a few weeks (!!! ), I'll be posting interviews on my blog celebrating the unique relationship between dogs and their people. "Fido and Friend in Five" will ask folks in the wonderful world of writing and publishing to talk about the dog(s) in their life, now or in the past, in five questions in five minutes. 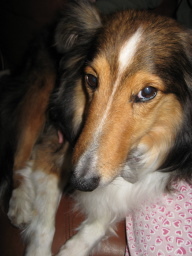 To get things started, I'm going to do my own "Fido in Five" with the sheltie who inspired my book, Teddy. How did you and Teddy find each other? I had wanted a sheltie for a very long time. 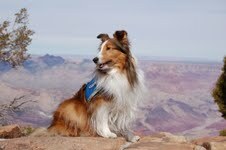 I first met Teddy when he was four at Sheltie Rescue of Utah. It was love at first sight! Unfortunately, he'd already been adopted and was just waiting to go to his new home. I was heartbroken. Then, two weeks later, Barbara at SRU called me to tell me Teddy was back! The family who'd adopted him discovered the dad was very allergic to him. They were very sad to have to return him but I was thrilled. It was truly meant to be! If Teddy could change just one thing about you, what would it be? That I ever had to leave his sight. Teddy would be happiest if we were Siamese twins! What is your all-time favorite dog story? Oh, there are sooo many great dog stories out there--classic and contemporary. If I had to choose one, though, it would probably be Lassie Come-Home. I think it's the best of the classics. I like to say my book is my own personal love letter to those great, classic dog stories. What makes Teddy's tale wag? Food, food, and more food! In five words, tell us what Teddy means to you: My heart and my inspiration. Bonus question: What is Teddy's favorite TV show? Teddy loves all the English classics on Masterpiece Theater. He's a very refined kind of guy (except when he's eating cat poop). A Dog's Way Home is available for pre-order and will be available in bookstores March 1! Okay, I know it's been a very, very long time since I blogged. And the only excuse I had was I just didn't think I had much interesting to tell you! But in anticipation of my book, A DOG'S WAY HOME, making its journey into the world the end of this month, I figured I have quite a bit to share! So first off, above you see the gorgeous jacket cover you will see when you get your own copy! Isn't it wonderful? Doesn't he look like he's talking right to you? Though she doesn’t normally gravitate toward stories about animals, Melissa Posten, children’s and YA buyer at Pudd’nHead Books in Webster Groves, Mo., was smitten by a forthcoming middle-grade novel written partially in the voice of a dog. I am not really a dog person. Actually, I'm not really an animal person. And if I'm being absolutely truthful, animal books are not my favorite—except for maybe some fantasy, and Kate DiCamillo—so you can imagine how I might feel about a non-fantasy book with an animal as a main character. There are some exceptions, of course, but not many. A Dog’s Way Home is an exception. A big one. It's like The Incredible Journey meets Because of Winn-Dixie, and those comparisons are not something I make lightly. Here's something I know: if the writing is great, it really doesn't matter if you love the subject matter on the surface. I opened this novel a skeptic and closed it in tears. The plot is simplicity at first glance: girl loves dog; girl loses dog; dog tries to get back to girl; girl tries to find dog. This is where Pyron's raw talent kicks in for the elevation. The story switches back and forth between 11-year-old Abby and her lost, beloved dog Tam, each fighting to get back to the other, and the voices are extraordinary. If an author can write a dog's voice so truthfully that the dog springs to life on the page; so truthfully that you can hear the dog's voice in your head—that author is one to watch. 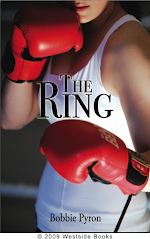 Bobbie Pyron is an author to watch. She has created two characters whom you root for from page one, and I followed them breathlessly—heart in my throat; tears in my eyes—racing through the pages to find if the wish I was clutching onto would be granted. Early in the book, Pyron writes, “And when the person he loves most in the world calls, a dog can do nothing but go.” When a writer of enormous talent gives the world a book, a reader can do nothing but love it. I was powerless against the pull of this book. More reviews are coming in, and more exciting news to come! I'll post those soon!